Modern stromatolites are laminated, often dome-shaped structures growing in salty lakes and lagoons. They consist of thin layers of lime-cemented sedimentary grains, capped by a live, slimy coating of bacteria. Cyano bacteria dominate the bacterial community living on the surface of a stromatolite. This simple life form is dependant on sun light for its photosynthesis and, just like plants, produces oxygen as a metabolic waste product. 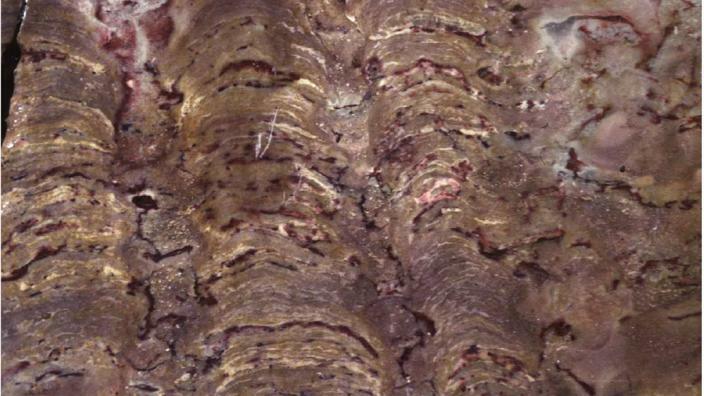 The North Pole area in northern Pilbara in Western Australia has produced some of the oldest known stromatolite-like structures in the world, dating back to 3.5 billion years ago. Although virtually all scientists working on ancient stromatolites agree that true stromatolites are definitely present in 2.8 billion-years old and younger rocks, opinions remain divided on the identity of stromatolite-like structures older than about 2.8 billion years. Some argue that these very old structure have a biogenic origin (built by bacteria) whereas others point towards a non-biological origin. The slimy coating of a stromatolite traps sand and silt particles suspended in shallow turbulent waters. These grains are eventually cemented together by lime, forming a single layer. This rock forming process forces the light dependant cyanobacteria to migrate through the hardening layer of sand and silt and form a new bacterial mat on the surface of the stromatolite.